The sudden political crisis in Venezuela has major reverberations across Latin America and the world. Both old and new dividing lines in the region have emerged since Juan Guaidó, the leader of Venezuela's National Assembly, declared himself the country's acting president in defiance of Nicolás Maduro, who has been ruling the country since 2013. In a continent where the United States backed coups in the 1960s and 1970s, Donald Trump's lightning-fast endorsement of Guaidó via Twitter was not taken lightly. Bolivia, Cuba and Nicaragua, which together with China, Russia, Turkey and Iran quickly supported Maduro, see the Maduro administration as the only possible ally in the region at a time when Latin America is moving away from 21st-century socialism. Beyond the halls of diplomacy is the pressing issue of refugees. On the other side, backing Guaidó, stand most of the other Latin American countries. In the middle are Uruguay and Mexico, the latter led by left-leaning Andrés Manuel López Obrador (AMLO), who is trying to distance himself from his predecessors; they have not recognized Guaidó, but are calling for dialogue. Beyond the halls of diplomacy is the pressing issue of refugees. According to the UN Refugee Agency, some 3 milllion Venezuelans have left the country in the face of a severe economic crisis. Most have relocated to neighboring countries: Colombia is the top recipient with one million migrants and Brazil's northern regions are also struggling to integrate the fleeing Venezuelans. A strong stance against Maduro's government would help Jair Bolsonaro in Brazil and Iván Duque in Colombia show their electoral basis that they are doing their utmost to address the refugee issue. These dividing lines are reflected in the front pages of newspapers around the region. Most left-leaning media have referred to Guaidó's declaration of power, and its subsequent approval from Trump and Latin American leaders, as an attempted coup in Venezuela. 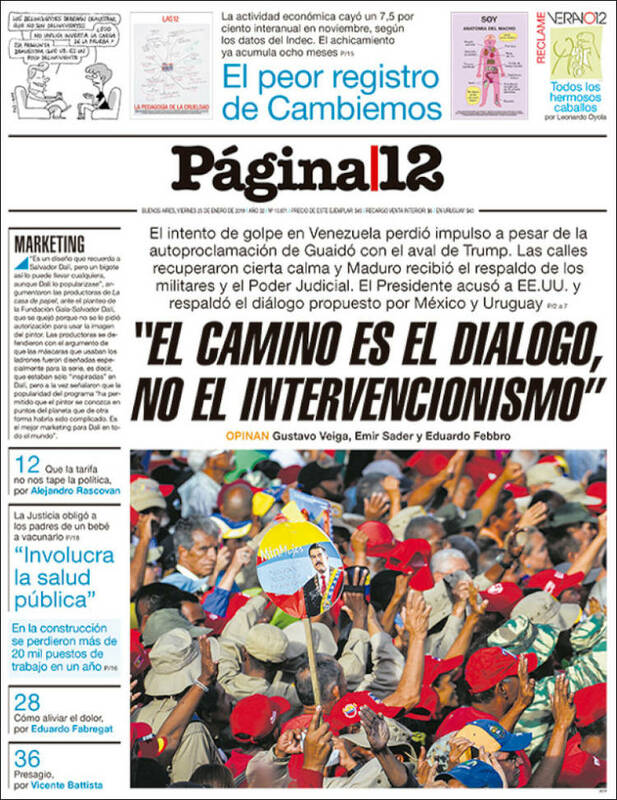 "Dialogue is the way forward, not intervention," according to Pagina12 in Argentina. 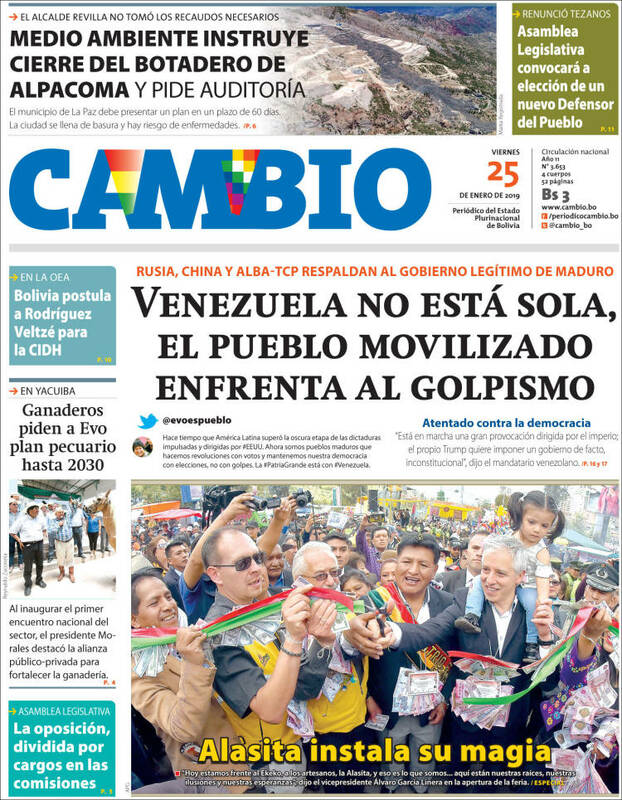 "Venezuela is not alone, mobilized people face a coup," read the title of Cambio, a state-funded newspaper in Bolivia, using one of President Evo Morales's tweets on the front page. At the other end of the political spectrum, the Chilean business magazine AméricaEconomía endorsed Guaidó in an editorial: "All this sounds reasonable if you think about the tainted 2018 presidential election that gave Maduro a second presidential term of six years, which he has just begun. And it sounds more than reasonable if you think about everything that the Venezuelan people have had to suffer and continue to suffer, plunged into a humanitarian crisis of food and medicine shortages that has lasted more than two years." In Colombia, El Espectador referred to Maduro as a dictator and usurper, backing Guaidó's actions. "Venezuela took a historic step for the constitutional return to the democratic path," said the Bogota daily in an editorial. Uruguayan papers have been cautious, reflecting the government's neutral stance. 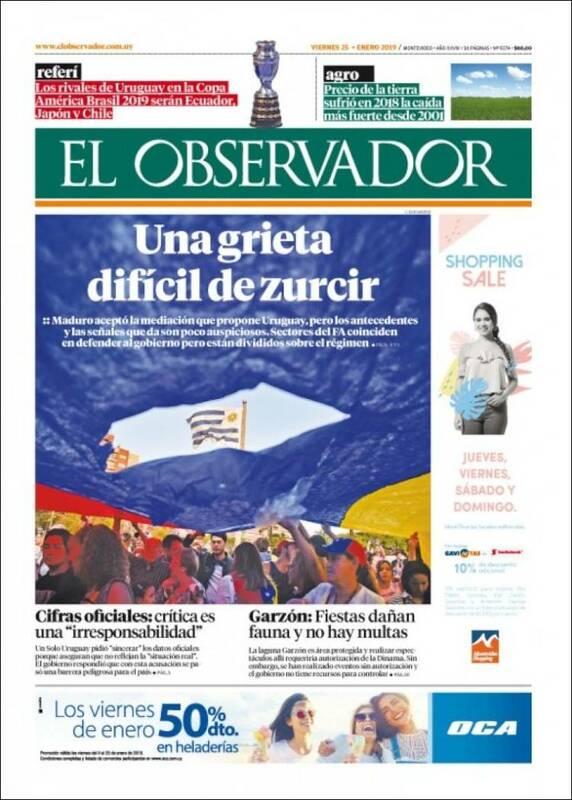 "A rift that is difficult to overcome," was one El Observador headline, highlighting Maduro's interest in Uruguay's proposal for dialogue. Whatever happens next, it's clear that the rest of the continent will be watching closely. This is best summarized by Chilean-Brazilian philosopher Vladimir Safatle in his piece for Brazil's Folha de Sao Paulo newspaper: "Right now, Venezuela is on the verge of civil war or international intervention. Far from being merely the result of its internal conflicts, the dramatic destiny of this oil-exporting country acts as a sort of magnifying glass for the difficult situations of Latin American politics. Venezuela has become a kind of ghost in which everyone sees their fears and desires." The rest of the continent will be watching closely. "In fact, it clearly exposes the collapse of both a certain experience of the left on the continent and its counterparts on the right," Safatle writes. He concludes with a grim warning: "The chances of a real catastrophe of unpredictable proportions are enormous. The worst of them would undoubtedly be the resurgence of open American imperialist actions."